I read a lot of skin care posts from a lot of different bloggers but i’ve never written my own so I thought i’d give it a shot. I think the world of skincare is so vast now and pairing that with the fact that everyone’s skin is so different, it’s easy to think that someone must by lying or at least bending the truth when they’re telling you how great x y and z products are for their skin but they truly make no difference to yours. When, most of the time, they really are benefiting from using their chosen products, they’re just not the right one’s for you. I’ve never been to see a dermatologist or even a skin care counter in boots but by the amount of oil that seeps out of my skin on a daily basis and how dry the corners of my nose and cheeks get, i’m gonna take an educated guess and say that my skin is combination/oily. So here are my top three basic skin care products. 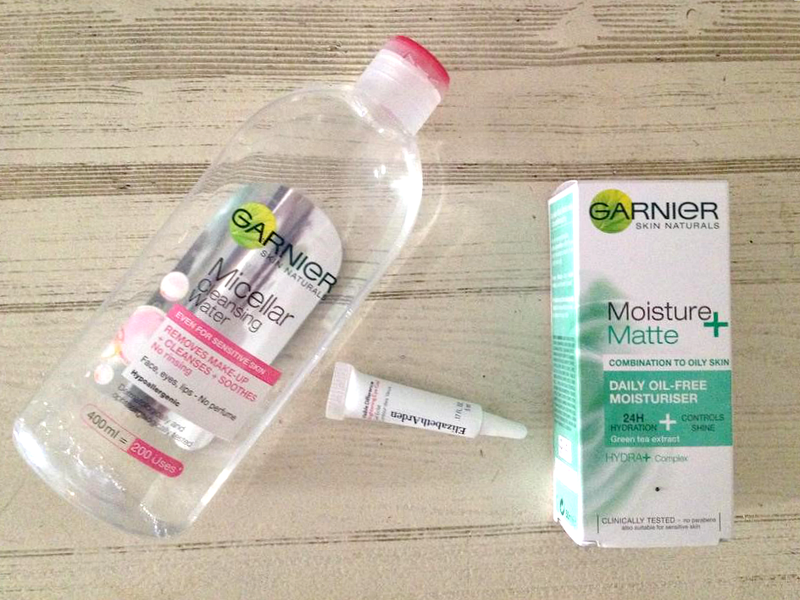 First up is an old blogger favourite and that is the Garnier Micellar Cleansing Water. I’ve been using this for about a year now, you can read my full review here, and I’ve grown to love it even more than I did last August. That and I tried the Nivea Sensitive 3in1 Micellar water, which everyone else on the blogosphere seemed to gel well with(see, everyone’s different!) but it burnt my eyeballs, yum. The Garnier Micellar Cleansing Water doesn’t dry my skin out or irritate it and it doesn’t leave my face feeling tight after I use it either. As mentioned in my review, you do need a little bit of elbow grease if you wear a lot of eye make up but it doesn’t irritate my eyeballs so, win. Currently available from Boots for £3.00 but if you’re in Gibraltar, Morrisons do stock it but they change the price all the time, sorry ya’ll! Next up is the Elizabeth Arden Visible Difference Brightening Eye Gel. As you can see in the photo, this is just a 5ml sample size, a third of the actual size of the tube you can purchase separately. I got this little beauty when I was repurchasing my current favourite mascara by Elizabeth Arden(there’s a post and a giveaway coming soon, keep your eyes peeled!) in a set which also includes an eye makeup remover which i’m yet to try out! I’ve been using an eye cream from work for the past 6 months and I really do like it but I think I may have been converted to this little bad boy. I love the consistency, it is quite rich but it pats into the skin like an absolute dream. As for visible difference, the skin around my eyes does look and feel smoother since using this product and certainly more hydrated. The full size product(15ml) comes with a roller ball which i’m desperate to get my paws on because I love the little roller balls, not only do they make for super easy application but they feel great too! Available at boots for £26. Lastly is a new moisturiser that I’ve been trialing. I’ve never really been too fussed about what moisturiser I use on my face, don’t judge me, it’s usually just something I grab in a hurry in the skin care isle in Morrisons or a decent priced one from Boots. Lately I’ve been doing a little research as my skin’s beginning to look a little tired and just really not at it’s best. As I mentioned before, I have combination/oily skin, more toward the oily side and I only recently purchased this moisturiser but oh my do I love it. 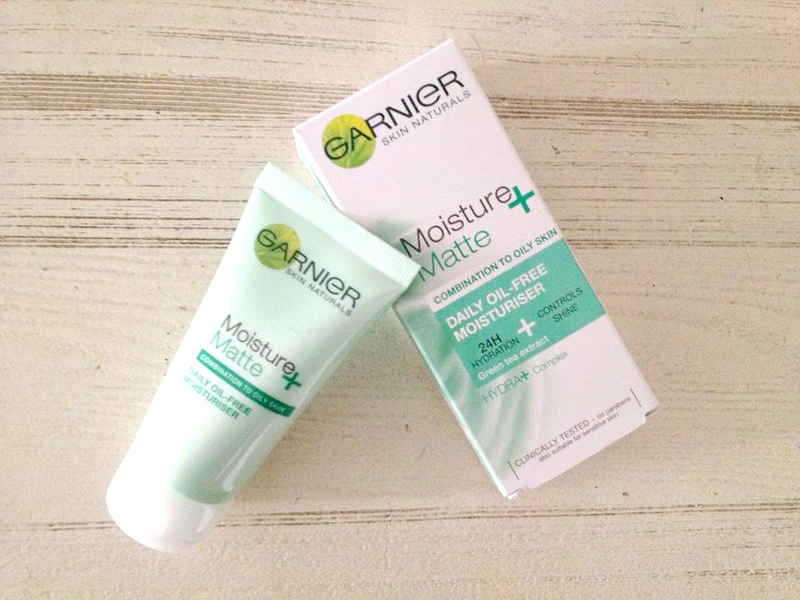 Garnier’s Moisture + range has something for all skin types including oily, dry and sensitive. My pick of course is their Moisture + Matte oil-free moisturiser. It claims to give your skin 24 hour hydration by locking in your skins natural moisture and controlling shine. It’s also enriched with green tea extracts which asides from being an anti-oxidant is also the magic behind mattifying and smoothing the skin. Let me tell you, it really does work amazingly with my skin! It smells incredibly fresh, feels really cool and soothing on my skin and doesn’t feel greasy at all. It’s even great under make up which is a giant plus. I find that a lot of previous moisturisers that I’ve used have make my make up look really flaky. I’m not sure how long this bottle will last but you really only need a tiny little dollop to cover your entire face and neck. A 50ml bottle is currently available at Boots for just £2, but once again, Morrisons are scamming their money off of us poor people and it’s around £5.50. Still a fairly decent price. So there we have it, my skin care favourites/essentials/basics? What are your current skin care favourites? Do you find it hard to find a moisturiser that suits your skin? Have you tried any of these products, what did you think? Let me know below!